Using a large spoon, scoop out the majority of the potato, leaving about a 1/3 of an inch. Using the half-cut method to make these sometimes makes the flesh tough to cut through. If that's the case, you can gently score around the edges before scooping to make it easier. Increase the oven temperature to 475°F. Place the potatoes back on the pan, cut side up. Brush them with the melted butter and sprinkle the inside with a little more salt. Bake for an additional 8 to 10 minutes. This will help firm them up so they won't fall apart. 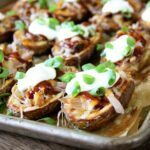 Remove from the oven and fill the potatoes with the pulled pork and sprinkle with the cheese. Return to the oven for about 5 minutes or until the cheese is melted. Drizzle with the Stubb's Sweet Heat Bar-B-Q Sauce (or other favorite Stubb's sauce), add a dollop of sour cream, and sprinkle with the green onions. Serve immediately.